Venom comes fueled with 512 Single patches and 256 Multi-sound (layered) patches created by a world-class sound design team—so you can start playing everything from bombastic basses, blistering leads, and 8-bit drums to grainy pads, menacing textures, and glitchy effects right out of the box. You'll also find a classic arpeggiator for added animation. Tweak the sounds using the intuitive top-panel performance controls—or dig in deep using the supplied software editor. Thanks to a completely new M-Audio synth engine, Venom merges analog flavor with digital power—providing a unique sonic signature that stands apart from the glossy sheen of other virtual analog synths. You get 41 oscillator waves and 53 drum sounds sampled from the most awesome vintage keyboards of the past four decades—complete with DSP-induced oscillator drift for a retro vibe. Each of the 12 simultaneous virtual analog voices features three oscillators, giving you tons of flexibility for octaves, intervals, and fat, detuned offsets. Venom even offers FM, sync, and dynamic wave-shaping on all waveforms for unique hybrid sounds. For even more sound-shaping possibilities, the Venom resonant multimode filter features 12dB/octave (2-pole) and 24dB/octave (4-pole) operation, with tube saturation limiting on the input for that classic overdriven sound. Each voice also sports three LFOs with selectable sample-and-hold to create evolving, rhythmic sounds—plus three AHDSR envelopes for total control of your unique sound. 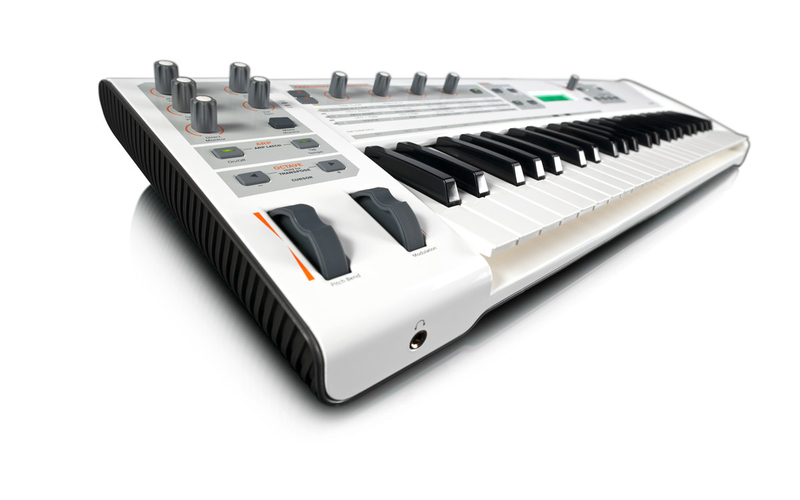 Why settle for a synth with toy-like keys or a clunky user interface? The Venom synth's 49 full-size, velocity-sensitive keys deliver a satisfying and inspiring musical experience for serious players. 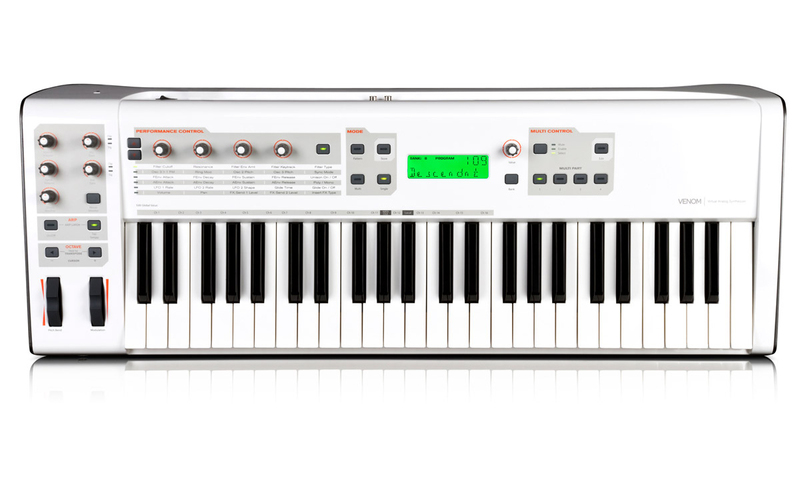 The four-octave keyboard is perfect for banging out bass lines, synth stabs, and blazing leads—while the intuitive top panel performance controls give you easy access to key synth parameters. Venom's Multi mode feature lets you trigger drum, bass, and melody parts simultaneously—perfect for performing live. Each part has a phrase sequencer for playing back drum patterns and pulsating synth lines, all BPM-synced via tap tempo. 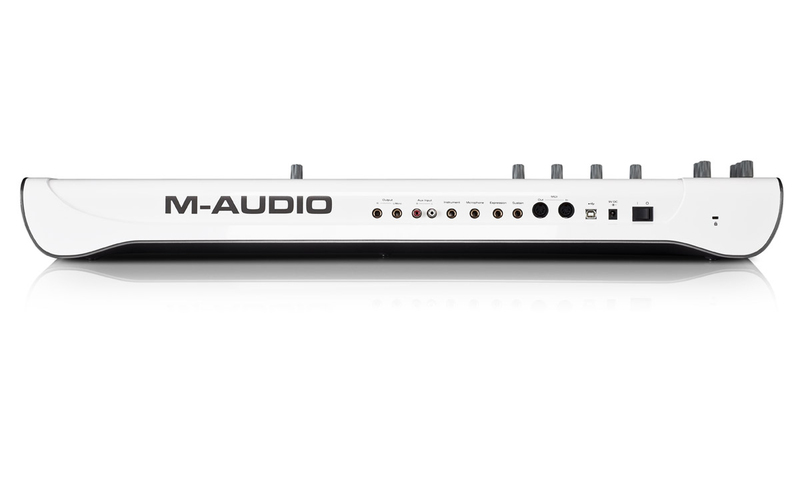 You can even switch melody and rhythm patterns on the fly—ideal for songwriting. With 256 separate patterns available across 256 Multi patches, you'll find plenty of rhythmic inspiration for a wide range of electronic music styles. The included Vyzex Venom software editor offers a clear visual representation of all Venom settings and parameters, freeing you to explore the synth's limitless sonic territory. Arrange sounds into banks, rename patches, save backups on your computer, and share sounds with other users. Use the innovative patch collider feature to mash up multiple patches and create new hybrid sounds. Venom offers more sound design flexibility than any other synth in its class. Explore new sonic territory with a large complement of onboard effects. Two global effects buses include Reverb, Delay, Chorus, Flanger, and Phaser. But it doesn't stop there. Each of the Venom synth's four multitimbral parts has its own effect insert for Compression, EQ, and Distortion—plus Bit Reduction and Decimation for the ultimate in lo-fi and glitchy electro. You also get Tremolo and AutoPan via an additional modulation path. These powerful effects can even be used to process external audio signals via the integrated USB audio interface. The Venom synth lets you spread its 12-voice polyphony across up to four assignable keyboard ranges. Use splits and layers to create custom stacked patches and keymaps with different sounds on separate sections of the 49-note keyboard. Dig in deep with keymaps and customize everything from velocity range to the response of wheels and pedals. You can also assign each sound to its own MIDI channel as you arrange compositions in your DAW. Thanks to a built-in USB 2.0 audio/MIDI interface, Venom unleashes the production power of Pro Tools* and other popular music software. Microphone, line, and stereo line inputs let you record vocals, guitar, and other instruments directly into your DAW—without the hassle of any additional gear. You can also record MIDI tracks into your software, then play them back in real time using the Venom synth sound engine. You can even conjure up wild new sounds by routing instruments and external audio signals through the synth's filters, envelopes, and LFOs. * This device is capable of outputting +12 dBV on the line outputs and 66 mW on the headphones. At these levels, the output noise performance will increase by 6dB. The rated output specs (+6 dBV, 33 mW) reflect what is capable with only USB as the source. ** CPU may be higher for laptops. Avid suggests you also check the minimum system requirements for your software, as they may be greater than the above. * CPU may be higher for laptops. Avid suggests you also check the minimum system requirements for your software, as they may be greater than the above.